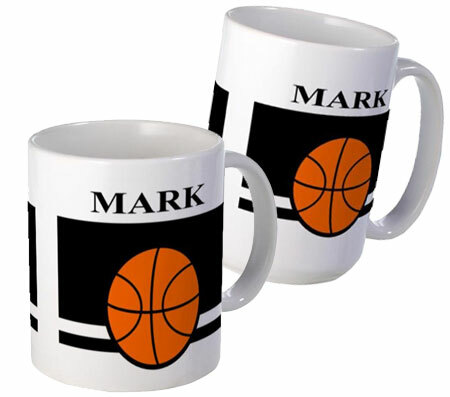 Large and small ceramic basketball coffee mugs customized with names and background color. To order your personalized mug drop an email to personalizedbyu@gmx.com with name to be printed on mug and background color. 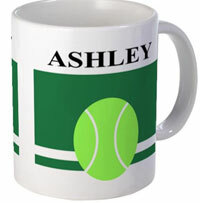 Your mug will be ready to buy online within 24 hours through Cafepress, a leading company in print on demand products. 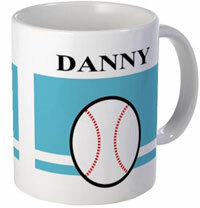 It's easy, just contact personalizedbyu@gmx.com.com with"Basketball Mug" in the subject line. State your color choice (can be any color, not just the samples shown here), the name you would like printed on the mug and say whether you are ordering the 11 or 15 oz size. It will be ready for you to buy online within 24 hrs during the work week. When you order through Personalized By U the big companies take less of the designer's commission. Thanks for your support.